If you are looking for top quality outdoor alfresco blinds in Melbourne, you’ve come to the right place. Our Alfresco Blinds will help protect your outdoor space and its contents. An open patio is beautiful but can improve when you make it an enclosed outdoor room. Our high-quality blinds allow you to enjoy the outside while remaining inside protected from the elements like the extreme sun, wind, dust, and rain. For more information on our outdoor alfresco blinds, or our other products such as pergola blinds, Ziptrak blinds or cafe blinds, Melbourne and Perth locals can contact us today. With the innovative and seamless design of alfresco bi-fold doors you can now bring the outdoors inside. 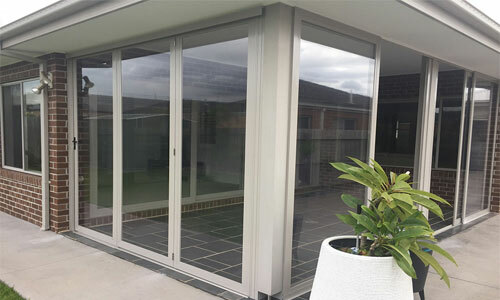 For four years, the team at Elite PVC have been providing a range of custom made outdoor alfresco blinds and doors for Melbourne homeowners to maximise the potential of their outdoor spaces. With over 16 years of experience in creating outdoor alfresco blinds and doors in Melbourne, we specialise in the manufacture and installation of high quality products. Elite PVC proudly sources all our blinds and related products from Australian suppliers so that when you buy outdoor alfresco blinds, alfresco screens or alfresco doors for your Melbourne home, you are supporting Australian manufacturing. All our doors are custom made and manufactured in our facility near Melbourne. We make bespoke doors for your outdoor space in the colour of your choice. We install the membrane of your choice using PVC, Vista weave mesh, and our latest membrane called Crystal Clear, which happens to come with a 15-year warranty. Our alfresco doors have no bottom track and are very easy to operate. They are lightweight and unbreakable. We make all of our products to the highest quality standards and back everything with a 10-year warranty. Our reputation continues to grow as our customers know they are purchasing the absolute best alfresco doors and blinds on the market. Designed to perfectly complement your outdoor space, Elite PVC supplies a variety of alfresco screens, doors and blinds are available in unique patterns and colours to suit your tastes. Our screens provide optimal protection and privacy for home inhabitants. Treated to withstand extreme weather conditions our screens are perfect for Australian homes. Whether you would like to add privacy to your home, create a secluded entertaining area or simply prevent harsh UV rays from entering your home, alfresco screens from Elite PVC are the optimal choice. Contact our team today for more information on our alfresco screens or other products such as sliding door blinds or patio screens. Homeowners looking for Outdoor Alfresco Blinds in Melbourne can trust the experts at Elite PVC! Elite PVC Bi-Folds & Blinds can help you add untold value and visual appeal to your home. Our doors and blinds allow you to enjoy your outdoor space to the fullest. Our doors and bi-fold doors create open spaces and help you bring the outdoors inside. Our blinds offer protection from the elements. We assure our outdoor alfresco blinds will benefit your Melbourne home. A home with a beautiful outdoor room most often sells much easier than other dwellings. For the best quality outdoor alfresco blinds, Melbourne and Australia wide customer can rely on Elite PVC! If you are on the lookout for beautifully designed doors, screens and outdoor alfresco blinds in Melbourne, you can count on Elite PVC products.